YOUR BEST BET IS MONTANE WILDLIFE! 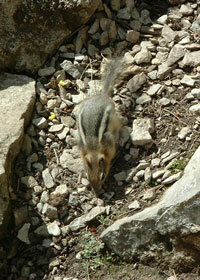 One of the most common questions I get asked is, "What kind of animals can I expect to see in the Canadian Rockies?". Since people usually spend most of their time in the valleys of the Rockies, chances are you are going to see montane wildlife - animals which live and travel through the montane ecoregion or montane life zone. WHAT IS A MONTANE LIFE ZONE? A montane life zone is the area of the valleys and lower slopes of a mountainous region. The first is by building Animal overpasses and underpasses which act as bridges from from one side of the highway to the other, allowing animals to travel safely across highways. Animal fencing which is being put up along highways goes a long way towards keeping wildlife off the road. It also encourages use of the animal over and underpasses here in Banff National Park. You can help by following the national park speed limit of 90 km/hr! Too many animals are hit and either killed or injured on the raod and, as a result, Parks Canada adopted a speed limit 10 km slower than the usual speed limit of 100 km. You can also help by never littering from your car. Not only does it look terrible and take away from nature's beauty, but it also attracts wildlife of all sorts to the side of the roadway which can lead them to their death. HOW CAN I MAKE SURE I SEE SOME ANIMALS? You travel all this way and want to see some species you otherwise may not have the opportunity to see. If you really want to see our wildlife upclose without any danger, visit the Banff Park Museun National Historic Site, located on Banff Avenue in the Banff townsite. This museum is the oldest natural history museum in Western Canada, and gives you the chance to see beavers and buffalo, birds and elk.